Employee engagement is the degree to which employees feel enthusiastic about their work, are highly committed and put their best effort in the growth of the business. 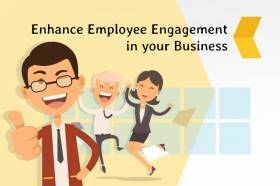 As employees are backbone of any business, so employee engagement not just meant for running your business smoothly, but also helps in overall success. Engaged employees are focused, full of energy and always present in the situation. They are constantly ready to do more than what is expected out of them as they feel connected with the purpose of the business. According to Gallup, companies with engaged employees outperformed their peers by 147% in earnings per share.